For most travelers, flying into Urumqi Diwopu International Airport (乌鲁木齐地窝铺国际机场/Wūlǔmùqí Diwōpù Guójì Jīchǎng) marks their first step into the Xinjiang province. The Urumqi airport is the primary transportation hub and one of only two airports in Xinjiang that offer international flights (Kashgar is the other). In the hopes of making things as easy for you as possible, I’d like to share with you everything you need to know about the Urumqi international airport. I’ve flown through this airport more times than I care to count and I’ve used every single terminal there is. 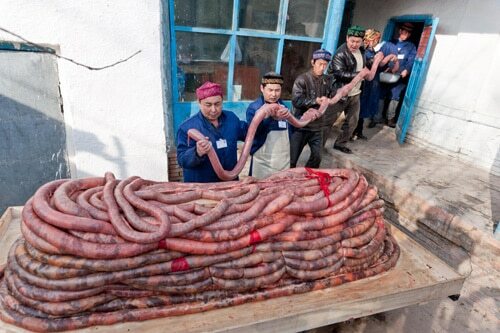 Keep in mind that all of this information is included in the comprehensive FarWestChina Xinjiang Travel Guide. 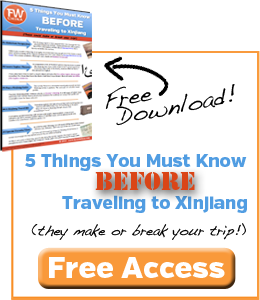 If you’re planning a trip anywhere in China’s Xinjiang region, this is an indispensable guide to help you along. *Note* Some of the links within this article are affiliate links, which means at no extra cost to you, I might be compensated should you choose to use the services recommended. Rest assured, I don’t recommend anything I haven’t used personally. Thank you for your support to make this website free to use! The Urumqi International Airport is currently divided into three different terminals which are creatively named “T1”, “T2” and “T3”. While the majority of travelers will use Terminal 2 and Terminal 3, there are a few small flights that still use Terminal 1. WiFi is available in each of the terminals, although it will require a Chinese phone number for text verification to use. There are ways to get a SIM card that will work in Xinjiang, but often I find that the easiest method to stay connected is to figure out creative ways to find WiFi in China. Urumqi’s Terminal 3, sometimes labeled “T3”, was opened back in 2010 and is the newest wing of the airport. Known for it’s “eagle’s wings” rooftop, it boasts a modern design and supposedly faster passenger check-in. If you’re flying on China Southern, chances are that you’ll be using Terminal 3, since this is their branded terminal. Unfortunately, there’s not much by way of food options in Terminal 3 of the Urumqi International Airport. There’s a KFC, a couple noodle places and some overpriced coffee shops. If you’re looking for a Starbucks or McDonalds, you won’t find that anywhere in Xinjiang, much less the airport. Finally, there aren’t many duty free options if you’re flying international out of Urumqi. They have a perfume shop, a cigarette shop and a liquor shop, but they’re really not worth stopping by. Urumqi’s Terminal 2 used to be the primary terminal prior to the T3 opening in 2010. It’s an older terminal, but it still functions well. Like Terminal 3, there aren’t that many food and drink options in Terminal 2. The best you’ll find is a Best Food Burger available before you enter the gate area (Xinjiang’s low-quality version of McDonalds). Past the security checkpoint there are a couple places to sit down and order tea or buy some last-minute, overpriced souvenirs, but that’s all. Although Terminal 2 is home to a couple China Southern flights, you’ll more than likely use Terminal 2 if you’re flying any other China airline. Terminal 1 is the smallest and oldest terminal at the Urumqi International Airport. Chances are, you’re not going to step foot in this terminal. Personally, I’ve only used the terminal once for an obscure flight to Khotan (Hotan). Don’t expect any food options in Terminal 1 or any lounges. Where can I fly to/from Urumqi airport? Urumqi has become a major hub for travel not just within Xinjiang but also internationally. Considering it’s strategic location there’s no doubt that will continue to grow. For simplicity sake, I’ll break out your flight options as either within Xinjiang, within China or internationally. There are a total of 24 airports in Xinjiang, including the Urumqi International Airport. However, not every airport in Xinjiang has passenger flights. Although you might not have multiple daily options, Urumqi usually services each of these cities at least once per day throughout the travel season. If you’re traveling within Xinjiang, don’t forget to grab a copy of the FarWestChina Xinjiang travel guide to help you understand the best places to visit and how to get there. International flights to and from Urumqi have increased rapidly over the past few years, a reflection of the increased importance of Urumqi’s central location. *Other smaller international are serviced on occasion, but these are the major ones. Instead of listing them all here, just know that Urumqi International Airport has non-stop service to almost every major airport in China and a few smaller ones as well. This includes Beijing, Xi’an, Shanghai, Guangzhou, Chengdu, Kunming and many others. 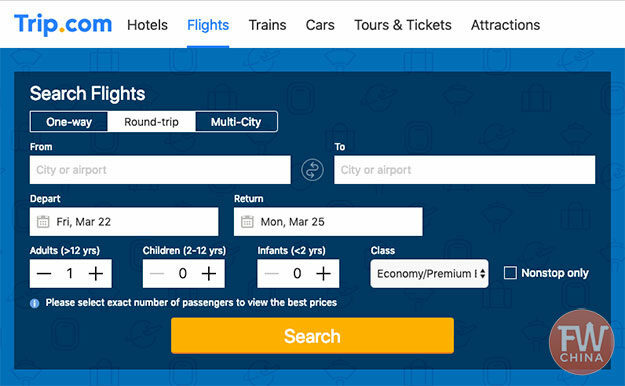 There are three primary ways that you can purchase tickets for flights to Urumqi but I’ll go ahead and tell you now that the best way is from the comfort of your computer. In general, purchasing flights in Xinjiang is no different than any other part of China. For that reason, I recommend you read through this 5-step process to get the cheapest China flights. Purchase Flight Tickets at the Airport: Ticket counters at the airport will sell you tickets on the spot, although I highly discourage this since you will have to pay full price for these tickets. They’re never discounted. Local Travel Agent: From inside Xinjiang you can easily buy tickets at the many local travel agencies. They can often get you discount that are equal to or greater than what you can find online. Purchase Tickets Online: By far the easiest and most accepted way to purchase flight tickets in Xinjiang is online. The most popular of these is a Chinese travel site called Trip. Flights found here are cheaper than international sites like Expedia or Kayak because Trip is a domestic Chinese company. They even offer their website in English. Search for cheap China flights on Ctrip. The most nerve-wracking part of arriving in a new city is getting from the airport to your hotel. I don’t know about you, but I’m always on high alert for getting ripped off, especially when I arrive at night. There are four primary ways that you can find transportation to/from the Urumqi airport. Opened in late 2018, Urumqi’s first metro is an attempt to ease the congestion that plagues the roads of the city. Line 1, the first of the planned metro lines in Xinjiang, starts at the Urumqi airport and travels south through the center of town and into the southern end of the city. Follow signs to the metro station and be ready to go through intense security and stand in line to purchase tickets using your passport. When you exit the baggage claim area in both Terminal 2 and Terminal 3, you’ll find a line of taxis that are a common way to get into the city. As long as you always take a certified taxi (it has a meter) and they drop the flag on the meter, you’ll be fine. Expect to pay between 40-60 RMB depending on where you’re going. Another option is to take the shuttle. They have a couple, some of which go to the city center while others go to the Urumqi train station, all with stops in between. There is a desk right before you exit the doors, so be prepared with the name of your hotel and show the clerk. They’ll let you know if they can take you there. By doing this, you’ll save yourself some money, as the average shuttle costs less than 20 RMB. Finally, there are a number of city buses that stop at the Urumqi International Airport that stop on the lower floor between Terminal 2 and Terminal 3. Keep in mind that these buses can take up to an hour to get to the city center, so although they only cost 1 RMB, they are unbelievably slow. There’s nothing to fear when arriving at the Urumqi International Airport. Most of the signs are in English and there are currency exchange booths outside of baggage claim. While you shouldn’t expect the highest level of comfort or the best food options at Xinjiang’s capital airport, everything runs pretty smoothly. Security is a bit tight (as it is all across the region), but you can rest assured that it’s safe to travel to Xinjiang. How about Los Angeles to Urumqi? Hi Josh, I’m planning to visit Xinjiang province , maybe April or may this year, how’s the weather there? I know that winter in the province is scary. So I moved my vacation in April or may. What kind of clothes do I need to bring? Depends on where you’re headed, Khacee! It’s still terribly cold in some places of XJ during that time of year and quite nice in other parts. I give a pretty good breakdown in the FarWestChina Xinjiang travel guide in terms of weather throughout the year. Perhaps that would be helpful? hi josh! im flying to xinjiang in a couple of hours and just wanted to thank you for your helpful posts!! hi josh, I have been in Urumqi once in 2010 , but I really couldn’t know the things which I found here. you have given the real vast info here. thanks mate. My pleasure, Rafi! I’m so glad you find it useful. Absolutely! They do have a van that goes between terminals but frankly speaking…it’s a 5 minute walk :) Unless you have tons of luggage, I suggest you just do the journey on your own two feet. Hope that proves helpful to you Tay! I need to rent a car when I arrive at Urumqi airport. Could you recommend a reliable rental Company? There’s only one car rental agency at the airport, but it’s difficult for foreigners to use. Not only do you HAVE to have a Chinese driver’s license (international licenses not accepted), you also have to have over US$1,000 cash to put down as a deposit since they don’t accept foreign credit cards. If neither of those are obstacles for you, then you can find the one car rental company outside the baggage claim of both terminal 2 and terminal 3 at the Urumqi airport. I will be arriving right after midnight & got a connecting flight to Kuqa the next morning 0820 hours. Is there any place for me to rest at the airport while waiting for my connecting flight? Or else, is there any more affordable hotel near the airport that I can stay. I am looking at a budget of around USD20-25 only. Any sleeping options without leaving the airport (a capsule etc)? Other than nearby hotels, there are no pods/capsules, etc. at this time. Sorry! I Shall be travelling from Islamabad to Beijing by China Southern Airlines. We shall have a stop over for two hours at Urumqi Airport and also change of aircraft. Can you guide me that whether we shall go through the immigration at Urumqi Airport or at Beijing. In case we will go through the immigration at Urumqi Airport then whether we will have to collect our luggage at Urumqi for our onward journey to Beijing. It depends on a lot of different factors that I can only guess from here. It could go either way. You’ll have to contact the airline directly to find out. I am a big fan of yours and had watched all yr youtube video. As a result, I am heading to Xinjiang for 3 weeks. I m planning to travel to Auckland on China southern airlines from Pakistan. There r 2 stops at Urumqi and GUANGZHOU airports for a couple of hours or more. I need to know whether these airports have international baggage transfer facility? Hi Josh, I am planning to travel via Urumqi with my wife. But the layover time is more than 16 hours, seems too long. Wondering how we could spend that time there? Currently we are in China. Great information, just what I was after. I do have one question, im flying from Almaty to Beijing with a stopover here in Urumqi, and the stop over it late late/early morning for 6hr, is there any where to sleep within the airport? Hey Tim! Unfortunately, the airport itself (either T2 or T3) have great places to nap. If you have the appropriate documentation you can get a cheap room at an airport hotel nearby, but that’s about it. I wish I could say differently! Terminal 1 has been reopened to passengers who are going to fly with several low-cost airlines. Please have a check on that and update your texts. My trip is from Baku to Sydney First stop at Urumqi then second stop at Guangzhou.All witChina Southern airline. Question 1: For first stop at Urumqi to Guangzhou, the layover is around 5 hours, first Do I need a visa? Second For transition Do I have to get out of the airport? Question 2: For second stop at Guangzhou to Sydney, the layover is around 15 hours, Can I wait at the airport for flight to Sydney (landing at Guangzhou at 6 pm and depart to Sydney at 9 am next day)? Hi Wilson. If you don’t have a Chinese visa, you probably won’t be able to leave the Urumqi airport. I wouldn’t mourn the loss, though – with only 5 hours you wouldn’t have been able to do much at all. Guangzhou does have a 72 hour transit visa available and since you’re traveling with China Southern, you can take advantage of the free hotel they over for overnight layovers. Ask a person at the airport when you arrive. I plan to be in urumqi early nov 17. Will the bus to heavenly lake tianchi still be running ? Any details you can provide would be appreciated. Hi Chin, I can’t confirm with certainty about the bus to Heavenly Lake. It depends on the weather, I believe. As for getting to your hotel, you won’t have a problem. There are plenty of taxis at the airport, even late at night. What is the best way to get from the airport to southern suburb busstation (in order to take the bus to Turpan)? Is citybus 51 an option? How long would that take? Is a taxi much faster? Hi Dingena, a taxi is definitely going to be a lot faster than any bus. The best time/budget alternative is to take the airport shuttle to the south train station (10RMB) and then take a taxi from there. That will be less expensive and comparatively fast. Does both Air China and Hainan Airline still depart from Terminal 3 in 2018? HI Josh, I’m traveling to China for the first time. My flight arrives at 23:45 at URC, are there taxi/shuttle options available to take me into the downtown Urumqi late at night? Or do you think I’d be better off getting one of the airport hotels, then traveling into Urumqi the next day? Hey Ryan, great question. There are airport hotels nearby, although they’re usually quite a bit more expensive. My guess is that it will be about the same whether you stay at an airport hotel or take a taxi downtown to a cheaper hotel. It really depends on how you’re feeling at 11:45 at night! Hi Josh, Your comments are very useful. I am flying with China Southern Airlines from Tashkent on October 5, arriving 7.15 am in Urumqi. What terminal will I arrive at? I depart around 12 noon to Guangzhou and onwards to Adelaide. What terminal do I depart from? Re luggage, would you advise booking luggage from Urumqi all the way through to,Adelaide? Hi Sandra, you need to be very careful here. You’ll likely arrive in Terminal 3 and it’s a toss-up as to whether you’ll depart from terminal 3 or terminal 2. Either way, if you didn’t purchase these tickets as part of a single itinerary, you could be in trouble. Double check with the airlines, but you might need to apply for a Chinese visa or else you’ll have trouble at the airport not being able to legally move from arrivals back to departures. And yes, if possible I would check luggage as far as I can. Thanks for the information. I am in hurry to find out if i need a transit visa for less than 9 hours of transiting from mid night to 8am? If you must leave the terminal and go through customs then yes, you will need some sort of visa. In this case, I believe the airport closes and you will be forced to leave for the night, so you’ll need to arrange a visa or risk getting stuck in a customs nightmare. I recommend reaching out to Old Road Tours as a reputable travel company. No travel agency is going to give you a letter of invitation unless you’re actually doing a tour with them, so I wouldn’t expect to travel independently if that’s what you need. As far as public transport and other questions, I highly recommend you grab a copy of the FarWestChina Xinjiang Travel Guide before you leave. Not only does it have useful travel information, it also gives you access to a private Facebook group where over 700 other Xinjiang travelers can answer questions and let you know more up-to-the-minute information. I hope that helps and thank you for your support! I am connecting throughUrumqi Diwopu International Airport Friday and am wondering if I will be able to stay in the airport overnight. I arrive at 110 AM and leave at 855 AM. Will I be able to await my connecting in the airport? some sites say the airport is open 24 hours others say it closes overnight. As I do not have a visa ( as it’s a connection only ) I am hoping to not leave the airport. No, the Urumqi airport closes, so you’ll be forced to leave and go to a nearby airport (there are a few to choose from, thankfully). Now that the airport metro has opened, do you know fare, frequency and travel times, please? Unfortunately, I don’t. I’m sorry.